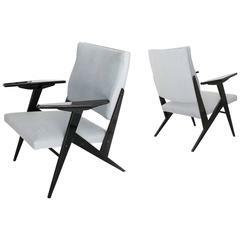 Jose Zanine Caldas Pair of Armchairs Model "H"
Jose Zanine Caldas sofa A collectible and rare sofa by Jose Zanine Caldas in carved wood using a single hide for the seat and back. The side is branded with “Zanine”. Brazil, circa 1970. Lierature: Suely Ferreira da Silva, Zanine: Sentir e Fazer, Rio de Janeiro, 1995, fig. 38. 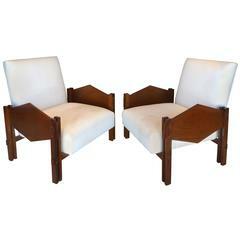 A pair of &quot;Z&quot; shaped tables created from a solid piece of Brazilian hardwood. The tables can be used as a coffee or side table as well as stools. 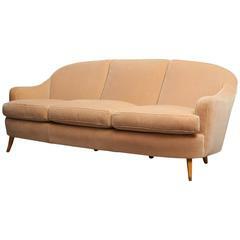 A sofa by Jules Leleu. Legs fitted with gilt brass, recently restored in velvet with contrast cord trim. 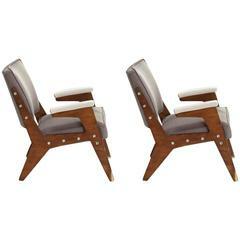 A wonderful organic pair of Jacaranda wood &quot;geometric&quot; armchairs by Brazilian master cabinet maker and designer Jose Zanine Caldas. Measures: Arm 21&quot; H, Seat 14&quot; H.